Worse still, in order to justify this thievery on a national/international scale that runs to trillions, the state and its partner the corporate/state media, has had to resort to the ‘trusted’ Victorian method of blaming the victim for their own poverty, their own shortcomings, their own misery. Ergo, Grenfell. Hence Grenfell Tower is an entirely predictable end product of the neoliberal agenda, just as flattening Syria is a product of the same sociopathic ideology. Or flattening the NHS for that matter. Hence it’s also no surprise that a person like Corbyn would come along at the same juncture in space and time as Grenfell this utterly ruthless but totally incompetent ruling class has dumped on us and done it in the name of democracy. Depressingly, it seems Corbyn is all we’ve got right now and he’s glued to the Labour Party, so we really have to ask ourselves at this critical juncture; can a Labour government deliver us from evil or will we just get a slightly different kind of evil instead? The reality is that Corbyn’s aspirations are also the aspirations of twenty million citizens, maybe more. That’s one-third of the population. It also means that at least one-third are not afraid of the word socialism. What an opportunity! Or will it be a missed one? But can these aspirations be transformed, not even into a socialist programme, but a Keynesian one aka 1945 by some future Corbyn-led Labour government? As regular readers of mine will know, it didn’t surprise me that Corbyn almost won the election, for Labour. All the ingredients were there for a perfect storm: the unemployed, the working poor, students, pensioners, and of course the awful Theresa May, all of whom saw in Corbyn the answer to their prayers. Here was a man they could believe in, he offered them hope. Add to this an increasing number of so-called middle class voters, who might be materially unaffected by Austerity, but be motivated by things like climate change/global warming, the destruction of natural habitat, pollution and war, endless war that now blows back big time, never mind Brexit. In other words, quality of life. So desperate in fact, that in spite of the Labour Party’s treacherous record of back-stabbing its members and its voters, it seems millions of us are prepared to give Labour yet another chance. So is it different this time? Will a Labour government (theoretically) under Corbyn’s leadership, initiate the process of dismantling disaster capitalism before it’s too late? Before the psychopaths in charge terminate human life on the planet in the pursuit of profit? Maybe we really are waking up at long last, at least that’s what I want to believe and clearly so do millions of other people. But can a Labour government deliver? The ‘middle class’ have always been a thorn in the side of the radical left; are they just upscale workers or actually of a different class? After all, they’re employees not employers so the real issue comes down not to their class but to where their class allegiance lies. In a traditional, industrial capitalist society their role has always been seen as some kind of buffer between worker and capitalist, their allegiances firmly with the ruling elite on whose largesse they depend but is this still the case and if it isn’t, is the MoD’s assessment of their potential new role, correct? It would seem that the government thinks that the ‘middle classes’ (or those who think of themselves as middle class) can no longer be relied upon by the state or by capital, to support the status quo and even contemplate the idea of them withdrawing their labour and uniting with what’s left of the organised working class. But it begs the question of how, exactly this newly class conscious middle-class would ‘lead’ the working class. They would first require an organisation and a programme. What would their programme consist of? Socialism? Some kind of technocratic state? And how long would it take I wonder, for the ‘middle classes’ to get their act together and realize that ultimately, their interests and the interests of the ruling class are not necessarily synonymous? So for example, who is better placed to ‘neutralize’ the security state’s apparatus (eg the GCHQ and its surveillance apparatus)? After all, the ‘middle classes’ design, build and run it on behalf of the capitalist state. So most definitely, a progressive, revolutionary middle strata is indispensable for the success of any socialist revolution, but lead it as well, as a ‘class’? But perhaps there is some basis for the MoD’s analysis. After all, with the diminished role of the organised industrial working class as the ‘leading revolutionary force’ in society as envisaged by Marx and Engels, who is to take over their role? And it’s true to say that as information technology, in all its various forms, has taken on the central role in the economy, are these ‘middle classes’ the new working class as the Mod alleges? But still we have to ask the question: how are the ‘middle class’ and the working class (including the unemployed, students, the old etc) to unite their forces and challenge the capitalist order? Is the Corbyn phenomenon a harbinger of things to come, with such things as Momentum that has so effectively used the new communication tools available to us–to reach out to such disparate sectors of society–actually initiating this new alliance? And if so, what does it tell us about the role of the Labour Party in the process? Does it even have one in this new situation? Corbyn makes all the right noises. People believe him largely because he sounds sincere. We are sick of being lied to continuously, and he comes across as genuine, and I’ve no doubt he is, but is this enough? Where do Corbyn’s real allegiances lie, with the voters or with the Labour Party? Forgive me for being somewhat cynical but the history of betrayal by the Labour Party is legion and Corbyn is a party man first and foremost and when push comes to shove, what comes first for Corbyn, the Party or the People? Surely, his capitulation over the emasculating changes made to his Election Manifesto by the Blairites is proof enough that for Corbyn, the Party comes first. So where does this leave the millions who have placed their faith in him (or is it the Labour Party)? Had the millions who voted for Corbyn actually won, they would have gotten, not Corbyn, but a Labour government populated mostly by Blairite neo-liberals who continuously undermined Corbyn (and as I write, continue to do so! ), even though he saved the Labour Party and a good many of the MPs who want him gone. Not a good start. The revised Election Manifesto already gives us a clear indication of who is actually in charge in the Labour Party and it ain’t Corbyn! To paraphrase William Morris, is Corbyn no more than the cat’s paw? I think so. The organised industrial working class, through its representative, the Labour Party joined the political class of the capitalist state when it entered Parliament, as Morris once more pointed out, whatever it was, it weren’t socialist. Essentially, the elite of the organised working class, mainly up until quite recently, made up of trade union bureaucrats who became an integral part of the ruling political class, accepting the rules of the ‘game’ and repressing any genuine revolutionary urges, telling us that they would ‘reform’ capitalism and that takes time. Well they’ve had over 100 years and since the 1970s, as a class, as a society, as the Left, we have been going backwards not forwards to socialism. Far from ‘reforming’ capitalism, with no opposition to speak of, it reverted to form; gangsterism, cold-blooded exploitation and, probably worst of all, the British state is attempting to justify, nay reclaim its colonial Empire! And we know where the Labour Party stands on this score! I really would like to think that Corbyn represents the beginnings of real change, and by himself along with the grassroots Momentum-led mobilisation that put him where he is now, I would agree. But it stands outside the Labour Party and derives its strength precisely because it is extra-parliamentary. 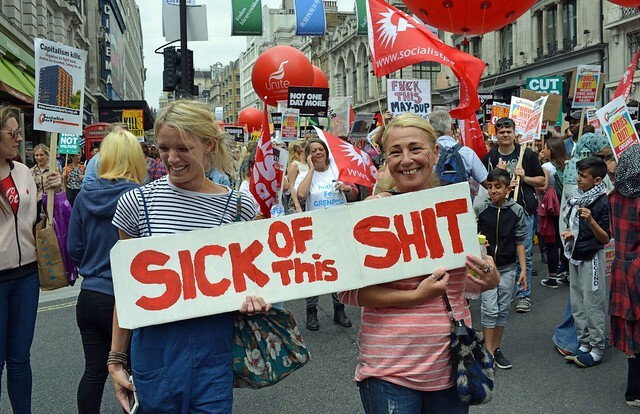 What we are really asking of Corbyn and whether they are aware of it or not, so are the hundreds of thousands who joined the Labour Party because of Corbyn, is a revolution inside the Labour Party first, never mind society at large. And there are those, not enough to make a real difference, who joined the Labour Party precisely with that objective in mind, but it’s not like it’s the first time this tactic has been tried (entry-ism). And again, the history of the Labour Party in this regard bears this out. It will go to inordinate lengths to neutralise or remove anybody who presents a challenge to the Party hierarchy and its ideology, especially from its left and the left in general. I might add that many of those on the organised left who try this method tend to be opportunists of the worst kind, ready to jump on whatever bandwagon that comes along and when it crashes, the first to jump off. 1945 could have changed the relationship between the left and the Labour Party, but it didn’t happen, the Cold War and our colonies made sure of that. Concessions were made by the capitalist class that ensured their survival within what appeared to be socialism with the Labour government adopting particular methodologies of socialist economic planning eg, nationalisation of key (bankrupt) sectors of the economy, the establishment of a national health service, public housing and so forth but without touching the basic elements not only of a capitalist state but an imperialist one! So not only did the Labour government preserve capitalism for future generations, they got the people to pay for it under the guise of calling it socialism! But what are the chances of a Labour government reversing, even in a timid fashion, the catastrophic impact of Austerity and global warmongering? Are we to believe that the capitalist state would just stand by and do nothing? Remember the plot against Harold Wilson’s Labour government organised by MI5 and the Army? In any case, is even a progressive, capitalist (Keynesian) programme possible after over 70 years has passed since it was introduced and under entirely different circumstances? I can’t emphasise enough that the changes made to Corbyn’s (draft) Election Manifesto are so drastic as to totally undermine his programme and make even his rather modest proposals simply unworkable. How can Austerity be reversed if the Election Manifesto states that it can’t be reversed? How can a future Labour government under Corbyn, stop waging war on the planet, if the idea of waging war is still an acceptable tool of capitalism? Okay, so Corbyn fudged it a bit by using NATO and no doubt the word reluctantly, in other words, the liberal’s version of compromise. Then of course, there is the penultimate challenge; the Parliamentary Labour Party, its bureaucrats and its intimate relationship with the capitalist state. The PLP consists only of Labour MPs, some of whom are nominated by Trade Unions. The PLP also gets to nominate 15% of the Executive Committee (EC) that theoretically anyway, formulates policy based on decisions made at the annual conference of the Labour Party. I might add that there’s plenty of room for manoeuvre at the conference as it’s where proposals from CLP branches can vanish in a maze of backroom committee meetings that only the ‘chosen’ (ie the Party hierarchy) know about. The National Policy Forum (NPF) of the British Labour Party is part of the policy-making system of the Party, set up by Leader Tony Blair as part of the Partnership in Power process. The NPF is made up of 186 members representing government, European and devolved assemblies, local government, affiliated trade unions, socialist societies and others, and individual members of the Labour Party, who elect representatives through an all member ballot. This is the Party bureaucracy, which is in the hands of the neo-liberals. But could that change with the enormous inflow of new blood (Labour Party membership apparently is now some 800,000 strong) into the CLP? Moreover, a key section of this new blood doesn’t come from its ‘traditional’ sources, the white industrial working class. Its new activists are young and from diverse class backgrounds. What it lacks however, is the political experience to see through the smoke and mirrors of ‘democracy’. Constituency parties are organised firstly by individual Parliamentary constituencies which in turn are broken down into Ward branches (the number of Ward branches is determined by the size of the constituency). Anybody can join the Labour Party, well almost anybody and exceptions are difficult to pin down, in advance. So for example, if you leave a comment somewhere on the Web and Head Office doesn’t like it, you’re likely to be denied the right to join or get yourself kicked out. Likewise, if you belong to another political party that Head Office don’t like (and they find out), that will also get you ejected. And, to be fair, Head Office does have point but it’s a moot point in the light of the behaviour of the PLP and the Party bureaucracy toward the majority of members. Breaking ranks publicly really depends on whose ranks you’re breaking with but theoretically, contradicting official Party policy, in public, is grounds for your expulsion. It’s called toeing the party line (elsewhere it’s called democratic centralism). Be that as it may, the next hurdle progressive members of the Labour Party have to jump is the relationship between Constituency/Ward members and the Party bureaucracy. So for example, the bureaucracy will try to limit the number of delegates to the Party conference who are opposed to their Blairite line, either through a manipulation of the rules or by browbeating members into supporting the status quo and if that fails, expel them. It’s all about being in control of the party’s machinery, where rules can be bent/broken, amended or ignored by the bureaucracy in order to maintain control of the apparatus and the Party’s (current) Blairite agenda. Thus it comes down to a battle between the Constituency Party members (all 800,000 of them) and the PLP/bureaucracy (along with the corporate/state media), best illustrated by the desperate, and ultimately unsuccessful, two-year fight to remove Corbyn. Well over 500,000 of the Labour Party’s new members are probably also new to political involvement, attracted by Corbyn’s message (and no doubt their own misery). This is a staggering number of people (by comparison, the Tory Party had around 150,000 members as of December 2016). So Corbyn finds himself nominally at least, the head of an entrenched political party that is an integral part of the capitalist state. We have, after all, had a two-party system imposed on us for decades, a regular Tweedledee, Tweedledum between Tory and Labour and the vast contradiction between the actual votes cast and the number of seats each party gets ‘awarded’ (first-past-the-post). The corrupt nature of our Parliamentary system (expenses scandals, coverups and lies, lots of lies), whereby the MPs ‘police’ themselves and write the rules that allegedly govern their behaviour, this is democracy? I don’t think so. It’s a corrupt and entrenched system that is impervious to reform. So what can Corbyn achieve at the head of this future Labour government and what do his supporters expect of him? Can Corbyn deliver what his supporters expect of him? And what will they do when they realise that in order to ‘lead’ the Labour Party in government, he has had to dump pretty much everything that made it worthwhile supporting him and his programme in the first place? If Momentum teaches us anything it’s about the power and centrality of extra-parliamentary actions. It’s how people were mobilised to put Corbyn where he is today, by Momentum and other ‘grassroots’ structures as well as the left in general. Of course the general’s comments have been disowned but the ruling elite knows how easy it would be to topple an unwanted government, simple flight of capital would do it without recourse to force to bring the country to its knees. And as we know, Corbyn backtracked on Trident, and then there’s the fiasco of Corbyn’s (draft) Election Manifesto mauling. Corbyn knows all to well what’s possible and what isn’t. Compromise is all well and good when the final outcome is positive but when the compromise is so total as it was with the Manifesto, the battle is over before it’s even been fought. But does this mean that we shouldn’t support Corbyn along with the millions who do? Of course not but the question is whether the Labour Party is the right vehicle to do it with. I’m positive it’s the very last institution to bring about radical change. Surely the experience of Momentum in mobilising the citizens gives us a good idea of the way forward. The problem of course is Corbyn himself, he’s a Party man and will be till the day he dies. To my way of thinking it’s a lost opportunity to shake up this degenerate and moribund system of which the Labour Party is an intrinsic component. 1. The estate where I live used to be managed directly by the local council. Prior to its transfer to a housing association, the tenants on the estate were asked whether they wanted to stay with the council or move to the new housing association (it contains a some dwellings purchased from the council). They voted for the housing association, though most now regret it, for as bad as the council had been, it was infinitely superior to the endless flow of contractors and sub-contractors that now flood into the estate almost every day, mostly repairing ‘repairs’ and ‘refurbishments’ performed by the previous contractors and sub-contractors, who no doubt replaced the ones before them, with cost not quality being the bottom line. So not only do we get inferior service, it actually costs a lot more and the housing association is even less accountable than the council had been (at least we could vote them out, or try to). This why Grenfells are inevitable, it’s a product of a rampant and unrestrained capitalism, shorn of its veneer of civilisation, where only money and power count. And it’s now called Peoples Momentum. Peoples Momentum is now (and apparently has been since June or July of 2016), officially part of the Labour Party. So before the election the ‘official’ Labour Party completely ignored it but now it’s proved its worth, it simply exerts its authority over it and brings ‘in-house’ so-to-speak. End of story and in all likelihood the end of Peoples Momentum as a grassroots movement. So no more grassroots except that is for Grassroots-Momentum that’s popped up, which looks like it’s picked up where Peoples Momentum left off now that Momentum has been hijacked. But is it an official Labour Party structure and if it is, why does it exist? It certainly reads like it’s official but it’s mired in all kinds of paradoxes not the least of which is its attempt to duplicate Peoples Momentum. Visit its website and you will see that the website is not actually Grassroots Momentum at all but it’s piggy-backing on a site setup in 1980 called Labour Briefing, a left-of-Labour Party publication that attempts to move the Labour Party leftward, from within. Grassroots Momentum appears to be everything the ‘old’ Momentum was except the name. But when you click on the ‘About‘ link, you’ll learn absolutely nothing about Grassroots Momentum but everything you need to know about Labour Briefing. Brilliant! This entry was posted in All Posts News Politics and-or Videos, Capitalism, England-UK-Britain, Housing, Imperialism, Politics, Socialism and tagged Austerity, Class Warfare, Grenfell Tower Fire, Jeremy Corbyn, Labour Party, William Bowles. Bookmark the permalink. The difficulty for the Left is the allure & ideological baggage of ‘class’ uniformity, conditioned responses invoked to resist the perceived face of oppression. United we stand as so forth. If politics is to have any deep philosophical relevance and existential meaning, it has to embrace diversity & fight restriction on the ground by asserting ethical rights ~ and also, demanding that those rights be upheld through the expected, accepted standards of decent everyday life. The full creative potential of human beings, no matter what their individual proclivities, background, potential and abilities may be, is what matters. We are the system. At present the architectures of control dictate experience. Corporate ideology is essentially just another religious hierarchy of enforced needs. This can be inverted, re-formed. It may seem fanciful to some, but it is the contexts of possibility that count, not the cultish ‘brand.’ The master key is free imagination, open ‘cosmopolitan’ existence. The connectivity of communities, their basic needs like water and fresh air, local environments, vibrant green spaces and the accountability of formal arrangements, through effective feedback protocols… these are the nodes that must be emphasized, affirmed & strengthened. Call it art, call it life. What it does, will be what it is. It’s kind of depressing. Blair turned to Neoliberalism and split labour into bits and pieces. Does Corbyn have the answers? Probably not. The middle classes are entrenched in fear of losing the little that they have—they have a piece of the status quo. No help from them. The real labour class is so unorganized that it reminds me of the Democratic Party in the US–not the ideology. I am thinking that not too far in the future real labour and real democrats with a small “d” will emerge as resistance to neoliberalism. Maybe the Occupy movement with millennials will finally emerge as a viable force. But I’m not holding my breath. Labour Party is like all “2nd” parties have become protectors of capitalism, a little reform here or there, but keeping the ruling class in power. Look at where they spend their time; shooting darts at the local or playing golf at grand country clubs? A Labour government is not an end to capitalism, far from it, but Corbyn’s well-received politics have the goal of bringing many out of poverty and relieved from exploitation as much as possible, with a message of peace and a warning to some of the wealthy. Preventing death and suffering in the short term is always a virtuous goal, and furthermore one that gathers the support of workers and gives opportunity to expose the hindrances of bourgeois democracy. To me it seems like a process communities have to go through: recognise the socialist and otherwise collective and kind aspirations you have for your community, attempt to reach those aspirations through the route you are taught to in the bourgeois state, recognise the impossibility of using this system for your goals -and the ineffectiveness of compromise and half-measures-, determine that the existing system must be dismantled to reach your goals.